Earn $4.84 in VIP credit (484 points)What's This? Biking can certainly be a challenge in colder climates where winters consistently feature accumulations of snow and ice. There's no reason to be forced inside and off the bike though. With the Ice Spiker, Schwalbe delivers a tire that provides traction for winter riding. 304 long metal spikes maintain purchase in extreme winter conditions, while the tread provides good grip on many off road surfaces. These tires are also very durable and provide a good deal of flat protection so you won't be stuck in the snow and cold changing a flat. I have used these tires for years, first on 26-in wheels and now on 29-in wheels. I started using the tires in SE ID, where I had to ride on ice and snow for at least 3-4 months of the year. I live in SE WA now, and so I use my set of 29-in tires less frequently, but they are ready in my garage. These tires will take you over sheer ice with no problem. The tires are good for going over packed snow, but as you might expect, not so great in snow over 4 or 5 inches. The tires are extremely durable (I have never had a flat with these Schwalbes). The studs last a long time. 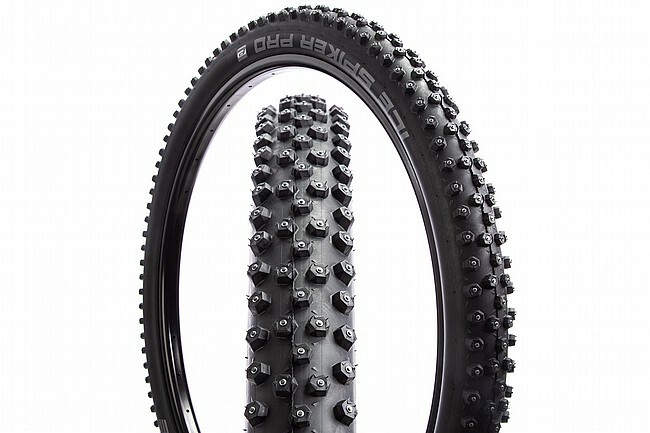 I have found a set of these tires will easily last 2 full seasons of heavy use, including the time of year where the roads are starting to clear, but you still need studs. The tires are heavy, but what would you expect. Lastly, the BTD price is great. I bought my current set through Wal-Mart for $121ea. At that time , it was the best price I could find. If you need a heavy duty set of studs, pull the trigger on these beauties. These tires are okay. Id suggest going with a concave stud. The 45NRTH Nicotine is much better if it fits in your frame. Not bad though, makes winter riding possible.